(Nanowerk News) Domestic sewage contains various organic substances, mainly from toilets and kitchens. These are harmful to the environment, but also contain energy. Researchers from Ghent University discovered how to efficiently extract this energy from the wastewater. Researcher Dr. Francis Meerburg (Center for Microbial Ecology and Technology): "The levels of organic matter in sewage are too low to be directly recovered. We investigated how we can use bacteria to capture this material. Our approach is unique because we have developed a high-rate variation of the so-called contact-stabilization process. " Hungry bacteria extract energy from sewage. Professor Nico Boon: "We periodically starve the bacteria, in a kind of 'fasting regimen'. Afterwards, wastewater is briefly brought into contact with the starved bacteria which are gluttonous and gobble up the organic matter without ingesting all of it. This enables us to harvest the undigested materials for the production of energy and high-quality products. We starve the rest of the bacteria, so that they can purify fresh sewage again. " By using the contact-stabilization process, up to 55% of the organic matter could be recovered from sewage. This is a huge step forward, because the existing processes cannot recover more than 20 to 30%. The researchers calculated that this amount can provide sufficient amounts of energy to completely treat sewage without the need for external electricity. "This is an important step in the direction of wastewater treatment that is energy neutral, or even produces energy," said Professor Siegfried Vlaeminck. Industrial partners already showed interest in the contact-stabilization process. Francis Meerburg: "Within my PhD, I could work with DC Water (Washington DC, USA), which is responsible for the purification of the US capital city. 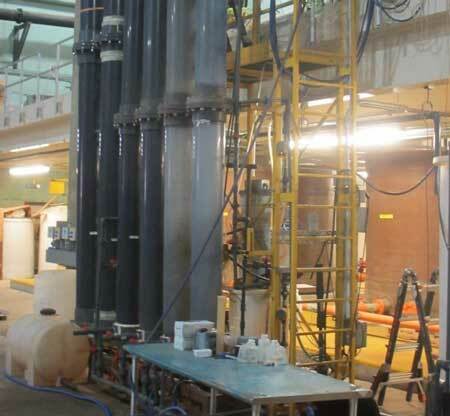 Currently, a contact-stabilization trial is performed on a part of their full-scale water treatment installation. They are evaluating whether the process can help achieve a more efficient wastewater treatment." Going from a lab development in Belgium directly to large-scale application abroad is not an ordinary event. The interest from the industry clearly shows that it is time for more affordable and sustainable processes in wastewater treatment.